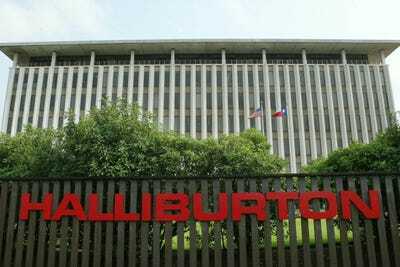 Halliburton has moved to overthrow the board of their rival Baker Hughes, according to The Wall Street Journal. This comes after talks of merging between the two reportedly hit a snag. “Baker Hughes is disappointed that Halliburton has chosen to seek to replace the entire Baker Hughes board rather than continue the private discussions between the parties,” Baker Hughes CEO Martin Craighead told the Wall Street Journal. Late Friday, a report from Bloomberg, citing people familiar with the matter, said that merger talks between the two sides have stalled over concerns regarding price and the potential sale of assets. Bloomberg said the two sides anticipate they would need to sell up to $US10 billion in assets for the deal to receieve regulatory approval. News of the talks, first reported by The Wall Street Journal on Thursday afternoon, sent Baker Hughes shares sharply higher, and after trading near $US49 on Thursday afternoon, the stock closed Friday’s session at $US59.89. In after hours trade on Friday, Baker Hughes shares were down about 2%. Halliburton shares, meanwhile, were down about 1%.